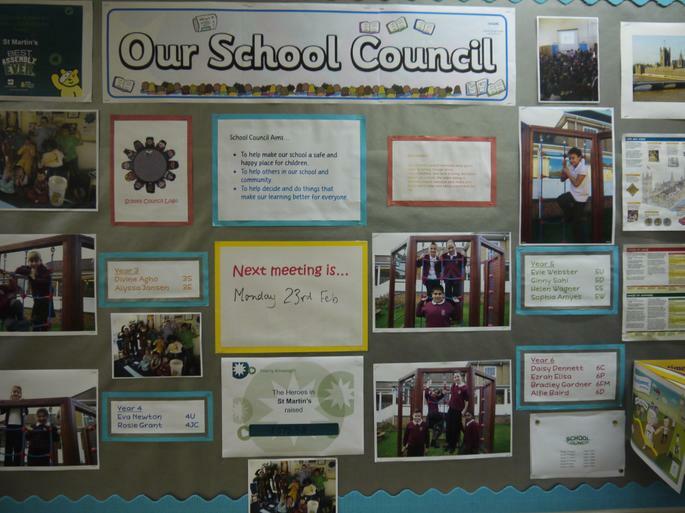 School Council Meetings take place every Wednesday lunchtime, 12.35pm in class 3C with Mrs Clements and Mrs Thomas. School Council Visit to Westminster Parliament: At the end of Term 3, the School Council travelled to London to visit the Palace of Westminster where they had a tour of the House of Commons and House of Lords. They learnt all about how parliament is structured and being part of a democratic society. They were most impressed with the number of police officers they saw and managed to get a photo with PC Robson. They represented St Martin's so well and look forward to sharing their learning with the school during collective worship after Half Term. Thank you to Mrs Clements, Mrs Thomas and student Miss Edmunds who took the children on their London visit, also to Mr Phillips who drove the children and staff to and from London in our school minibus. Our School Council members spent a morning helping out at Weston Foodbank during December. They packed Christmas parcels and sorted donations and their help was really appreciated. Fairtrade Conference at Wells Cathedral: The School Council have learnt more about Fairtrade at the conference they attended during Term 4. They learnt about how trade can be fair and also unfair in addition to finding out which countries produce different fruits and vegetables. They will be presenting their learning in Key Stage 2 Assembly in Term 5. Thank you School Council for representing our school so well! This year the School Council did the 'Best Assembly' ever to raise money for Children In Need. We included many fun things like dances, trumpets and the choir sang their song. Everyone enjoyed watching the entertainment. Every pupil brought £1 to give to Children In Need. Overall we raised £575.58. Each class joined in with activities throughout the day. Thank you for all the children who helped raise money. In recognition of their hard work this year, the School Council pupils together with Year 6 Writing Group were invited to an Educational Visit to ‘The Wild Place’ in Bristol, during Term 6.